Motorola's smartphone shipments slowed considerably in the fourth quarter. NEW YORK ( TheStreet) -- Late Friday, after the market closed, Motorola Mobility ( MMI - Get Report) sent out an innocuous-sounding press release with a "Business Update" in the title. The release ended up tanking Google's ( GOOG - Get Report) stock by more than 4% on Monday and the sell-off continued on Tuesday, even after the market bounced out of the gates. 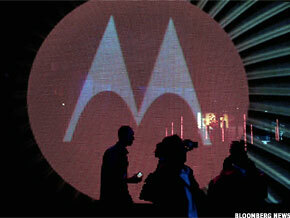 "Motorola estimates sales of $3.4 billion with modest profitability on a non-GAAP basis. These estimates include shipments of approximately 10.5 million mobile devices, of which approximately 5.3 million were smartphones. Motorola Mobility's fourth-quarter results were impacted by the increased competitive environment in the Mobile Device business and higher legal costs associated with ongoing Intellectual Property (IP) litigations. The Company estimates sales of $900 million for the Home business in the fourth-quarter. Motorola Mobility will issue its fourth-quarter 2011 earnings results at approximately 3:00 p.m. U.S. Central Time on Thursday, January 26, 2012." That $3.4 billion revenue target is 10% less than analysts' expectations. This will surely impact earnings per share which consensus estimates put at 37 cents per share for the quarter. There are several puzzling things about this announcement. First, this was supposed to be the holiday quarter that is a blockbuster for the company. Can you imagine if Apple ( AAPL - Get Report) pre-announced that its holiday quarter was going to be 10% less than its already conservative guidance? It is also interesting to note how far ahead of Motorola Apple is in terms of smartphone shipments. Motorola shipped (but didn't necessarily sell -- ask Research In Motion ( RIMM about the importance of the distinction) 5.3 million smartphones last quarter. Horace Dediu at Asymco, who has consistently been one of Apple's best prognosticators, believes Apple will sell nearly 36 million iPhones this quarter (to be announced next week). The analysts also had thought Motorola would do $3.3 billion in revenues in the first quarter. But they had also expected big things in the fourth quarter, so it's very likely that these estimates will have to drop in the coming weeks. What's also remarkable about Motorola is the range in analyst estimates for the coming year. In the current quarter, 23 analysts covering the company range from EPS guesses of 4 cents a share to 58 cents. For all of 2012, 37 analysts covering the company vary in their estimates from 28 cents a share to $2.19. How can there be so much uncertainty about the company? Motorola has blamed an "increased competitive environment" for the decline in the quarter. However, it seems to have hit a wall in terms of smartphone shipments. In the second quarter, the last quarter of reported results before Google acquired the company, it shipped 4.4 million smartphones. Going back to the fourth quarter of 2010, Motorola shipped 2 million smartphones. This increased to 2.3 million in the first quarter and then 4.4 million in the second quarter. It will now do 5.3 million in the fourth quarter. It appears as though the company has hit a severe slow patch since the deal with Google was struck. At the same time, as this has happened, HTC's stock has sold off in Taipei -- down by more than 54% since July 1. Part of the reason for this decline has been a profit drop and repeated sales outlook cuts. Its shipments dropped to 10 million units in the fourth quarter and will drop further to 8 million units in the first quarter (and remember Motorola's total units -- including smartphones and feature phones -- was 10.5 million in the fourth quarter). HTC shipped 13.2 million units in the third quarter last year. Some analysts like Peter Liao at Nomura have pegged this drop from increased competition has come "at the high end from Apple and Samsung." It's obvious that Apple has done well over this period but less is known about Samsung. 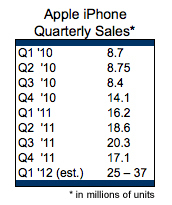 For comparison to Motorola's smartphone shipments, Apple increased its quarterly sales of iPhones starting in the first quarter of 2010 (or the fourth quarter of calendar 2009) as seen in the chart below. If Dediu is right, Apple will outsell Motorola's shipments by 6.8 times. In the June quarter before Google's acquisition, Apple outsold Motorola's shipments by 4.6 times. So the pace of outselling has only increased in the last six months. It would be great to understand if Samsung was suffering from similarly tepid shipments as HTC and Motorola or if it was somehow selling as well as Apple. If they were selling as well, it might be fair to put Samsung in the "high end" category with Apple. Yet, it seems to me Samsung is likely to be suffering the same competitive dynamics as HTC and Motorola. And those "competitive dynamics" might just be a fancy way of saying people don't really like Android phones as much as they like iPhones. And maybe all these market share "studies" funded by carriers, which show Android on top in terms of "shipments," are actually a bunch of bunk.